Here is the Big Y Flyer, valid April 19 – April 25, 2019. 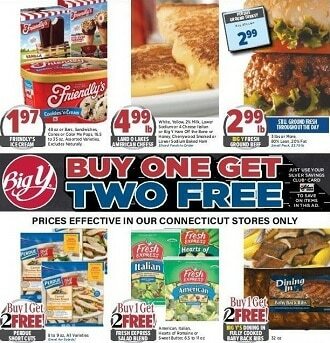 Don’t miss the Big Y Sale specials, printable coupons and grocery deals & discounts from the current Ad Circular. Find super savings for Birds Eye Vegetables, Butterball Turkey, Nabisco Triscuit, Live Fresh Brewster Oysters, Full Circle Sockeye Salmon Fillets, Baked Chocolate Chip Cookies, Hood Golden Egg Nog, Coconut Curry Chicken with Cauliflower & Peas, Wild Caught All Natural Sea Scallops, TRESemme Shampoo or Conditioner, Listerine Mouthwash, Prince Edward Island Mussels, Vita Prepared Horseradish, and more. Don’t miss this weekly flyer deals and don’t forget to print off your coupons before heading out this week to shop.